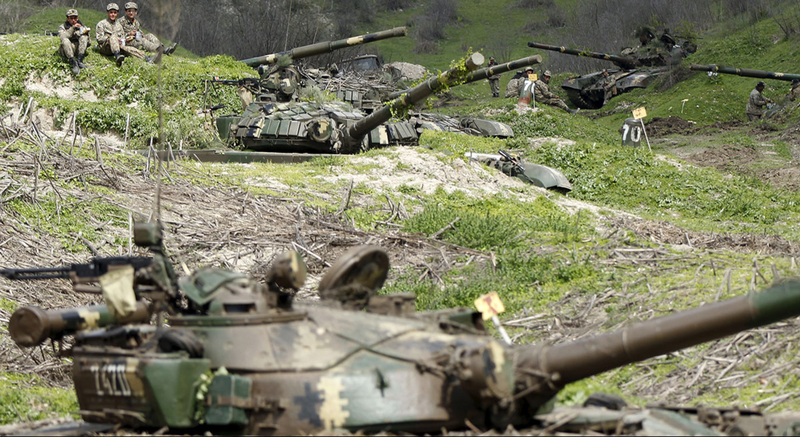 There is still no universal consensus on how to define the series of military actions between Azerbaijani and Armenian forces on the week of the 1st of April. Is it a warming of a frozen conflict? A spike in hostilities? Or a 2nd Karabakh War? One thing that we can agree on is the different impact this event has had on Armenian civil society and policy makers as a whole. The entire Armenian nation spread across continents focused its attention on Karabakh for a week; sharing and swallowing any bit of information, speculating about strategies, causes, casualty figures, and scrambling to help the families of the victims. Citizens organised donation drives, and relief efforts in an impressive display of spontaneous civil society mobilisation, while thousands volunteered for service, to the point of overwhelming recruiters with applications. With the support of their compatriots around the world, the defenders of the beleaguered Nagorno-Karabakh Republic were once more able to repulse their enemy. Widespread concern among the Armenian public that the sluggish economy, and undelivered promises of Independence would hurt national pride, meaning that people would be less enthusiastic to take up arms again in defence of their country ( as opposed to the widespread furvor which characterised the 1988 Karabakh Movement). These fears didn’t materialise. As the commentator, Nareg Seferian pointed out, the grassroots mobilisation of relief efforts by civilians, as well as the long lines of volunteers forming at military bases, demonstrated that Armenians had not lost their readiness to defend their homeland. Interestingly, Armenian civil society has managed to avoid the ‘call to nationalism’ trap by disassociating their support for Armenia’s safety from blind obedience to the State. All political parties pledged their support to the Armenian Army during the conflict, only to resume (with the exception of former President Ter-Petrosyan) their demand for accountability from the authorities as soon as hostilities ceased. 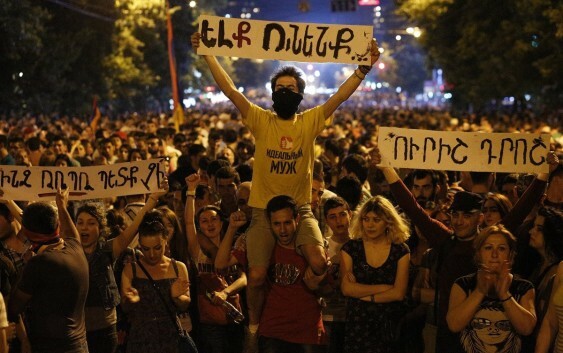 This distinction was also seen among youth activists who, fresh from their successful resistance to government overreach during last summer’s #electricyerevan movement, refocused their efforts towards supporting Armenian servicemen on the front line during the heaviest fighting. These events did not, however, distract them from their goal of achieving government transparency, an objective made ever more relevant by the plight of their kinsmen in Karabakh. It’s good to see that the Armenian national discussion has managed to move past primitive “rally around the flag” narratives, in a tell-tale sign of maturing democratic consensus. The fact that Armenia made headlines for being the 2nd country after Iceland to force the resignation of an official in the wake of the Panama Leaks is even more significant on the backdrop of speculation that President Aliyev may have ordered the start of hostilities to distract from revelations of corruption in his family. 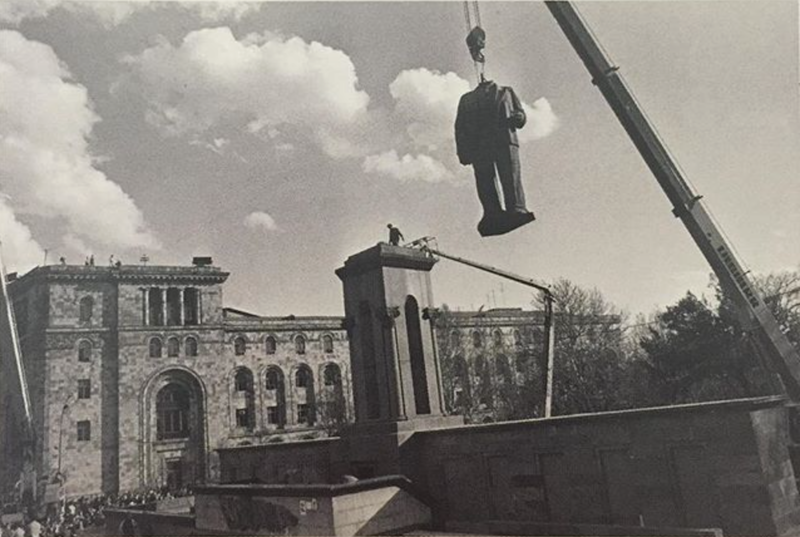 Armenians were abruptly introduced to the nation-building role played by the country’s minorities, when photos showing Azeri soldiers holding the decapitated head of Armenian serviceman, Karam Sloyan surfaced on social networking sites. Sloyan was a member of Armenia’s largest minority group, the Yezidi Kurdish community. He wasn’t the first ethnic Yezidi to fall in the line of duty either. Sidar Aloyan, another ethnic Yezidi serviceman, was killed while defending his post in a similar Azerbaijani attack in December. Despite being frequently dismissed, or mostly ignored by Armenian society as a whole, Yezidis have been involved in some of the most defining moments of Armenian history. As the descendants of people condemned as heretics and expelled to the eastern shore of the Arax river along with refugees fleeing the Armenian Genocide, Yezidis volunteered in large numbers to fight, and in many cases, died, as Fedayeen alongside their ethnic Armenian compatriots in the battlefields of Karabakh. 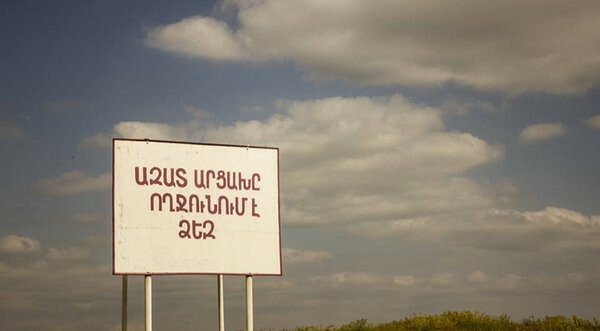 Armenia’s new constitution guarantees five seats in the National Assembly for ethnic minorities, meaning that as of 2017, Armenia will be the only country in the world with dedicated seats for Yezidis, amongst others. In another sign of deepening solidarity, Armenian officials also recently unveiled a Yezidi Genocide memorial in Yerevan. Parliament’s calls to recognise the ISIS campaign against the Yezidis of Sinjar as Genocide also points to a readiness to accommodate minorities. The recent round of fighting has also highlighted the differing views on the role of women in armed conflict. Azeri media profusely ridiculed the fact that many Armenian women have volunteered to carry arms in defense of their homeland. News outlets, and other pundits in Azerbaijan attempted tried to shame Armenian men due to the perceived view that Armenian women had to leave their traditional roles in the kitchen in order to take over the fighting from their “emasculated” male counterparts. One Azeri website with government links, misreporting renowned television personality Nazeli Hovhannissyan for an “Armenian female sniper” in an interview with an Italian television station, used the footage as ‘proof’ that Armenian men were cowardly allowing their women to fight for them. Images of women in uniform, by contrast, were well received by Armenian audiences and should be encouraged as a reminder of the equal role that citizens of all genders play in the defense of their homes. This notable difference should also translate into a more integral role played in other spheres of Armenian society. Corruption allegations are not new in Armenia. Such accusations have been made by members of the business community, civic activists, international organisations, and disgruntled former presidents alike. Though Armenia has made some progress in fighting graft, international watchdogs argue that there is little political will to do more than the bare minimum. The recent escalation of the conflict has thrust this burning issue back into the spotlight with a vengeance. As many concerned Armenians generously donated to various charities helping communities affected by the fighting, or the families of fallen servicemen, many were surprised to see the official social media pages of the Armenian Government posting bank account information. Requests were made for direct donations for necessities, such as warm clothing, care for wounded soldiers, and other medical equipment, despite decades of direct financial support by Diaspora organisations, and a generous defense budget. Many have questioned the military’s ability to care for its wounded in the event of a full-scale war if emergency funds were necessary for the care of 101 injured in a four day, low-level conflict. 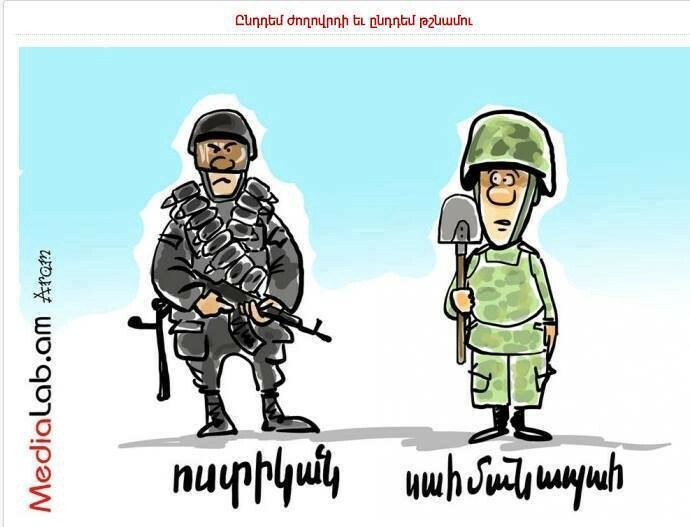 As this most recent round of fighting came to an end, trending social media hashtags, such as #NKpeace and #NKnow were replaced by #փողչկա (a typical Armenian expression used to explain away policy failures due to inadequate funding, literally translated as “There’s no money”). The hashtag served to contrast rudimentary conditions, and equipment endured by Armenian military units with reports of lavish spending, often at taxpayer expense, by government officials. Commentators have also uncovered cases of large-scale graft, and clientelism, where notorious oligarchs were granted various service contracts to the military. The notion that the Armenian Government is too cash-strapped to provide those who defend this country with the right means to do so on a $3 Billion yearly budget has struck a particular nerve among taxpayers. New investigative reports unveiled lavish spending schemes at taxpayer expense, such as the $45 million Central Bank Research Centre in Dilijan, or the $25 million training centre for Revenue Service officials. This facility, in particular, included swimming pools, whirlpool bathtubs, gyms, saunas, bars, restaurants, tennis courts and a cinema hall equipped with expensive projection and sound systems. The cutlery alone reportedly cost $85 000. A particularly damning report by Civilnet stated that if some of the nation’s most notorious oligarchs paid the roughly $90 million in back taxes they owe for this year, the Armenian military would have been able to purchase most of the high-tech weaponry that Azerbaijan has been using as market rates. (rather than the reduced CSTO rate that Armenia supposedly enjoys). If corruption and opaque budgetary decisions had a negative effect on socio-economic development before, the recent four-day-long escalation of the conflict has shown that it now an existential threat. Armenian civil society should now see the need for a democratic forum to address government spending discrepancies and transparency in the allocation of government contracts both in the country and abroad as an absolute priority. One common trope characterising the Armenian narrative on the Karabakh conflict is the massive use of civilizational undertones. Armenians like to remind everyone that we fight against a vicious opponent with one of the world’s most appalling human rights records, where journalists are often persecuted, where minorities are oppressed, and corruption is rampant. Our neighbour to the West, Turkey, has also shown signs of regressing into authoritarian rule, with little room for tolerance of minorities, and political descent. Though this may be true, our country fares better only in comparison. A quarter-century after regaining independence from the Soviet Union, Armenia has made some modest improvements, but corruption-related issues, an incomplete democratic transition, and a lack of transparency in government affairs continue to hamper long-term economic growth, and consequently, the country’s ability to defend itself. Armenia’s precarious geographic location, in a region dominated by autocratic states, make the need for defining our national values that much more critical. If our opponents are corrupt dictatorial regimes, which stifle human rights, and individual liberty, then we need to ensure that we stand for the exact opposite. Armenia was once praised as one of the most promising democratising states in the FSU. Unfortunately, this premature accolade has had the effect of lowering the bar of expectation, with Armenian officials feeling content that Armenia’s situation was “better in comparison with Azerbaijan”. As a result, democratic reform, anti-corruption efforts, and other progress stalled across the board, with Armenia showing little change in these fields over the last decade. Democratic reform and further market liberalisation are as pertinent as ever now, as they can directly affect national security. Over the last 20 years, the poor economic performance primarily due to sluggish reforms has forced Armenian officials to rely increasingly on the presence of certain regional powers as an immediate security guarantee. Given the fact that free markets and democracy are essentially mathematically proven to positively affect living standards, one has to wonder why more efforts are not made to achieve these aims. Some have argued that a lasting resolution to the Karabakh conflict will only come to fruition with the establishment of a real democratic change in both Armenia, and Azerbaijan. Regardless of the endgame, this recent bout of fighting on the front line will have a lasting impact on Armenia’s democratic process. Hopefully, the ability to disassociate patriotism from blind devotion to the state, the acknowledgement of contributions by others in the country’s nation-building and subsequent inclusion into decision making, as well as the urgent need to distinguish ourselves from our opponents will help fuel a new drive to tackle the issues which still plague this land. Armenia’s future depends on it.